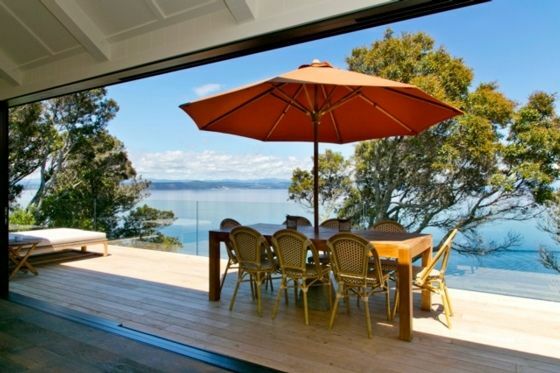 Secluded in very private & safe, gated community, our villa offers an excellent getaway from the hustle & bustle to be perched directly above the beautiful Whakamoenga Point on the shores of Lake Taupo. INCREDIBLE private villa, modern & very cozy perched directly over the most exquisite & private part of Lake Taupo (Whakamoenga Point). Only 3 mins walk through a lovely native NZ bush track down to the beautiful, crystal clear water of lake Taupo. The Villa has been built to create wonderful memories for a very social family who loves to entertain in the free flowing indoor/ outdoor spaces & enjoy the enormous amount of activities Taupo has to offer to both the Winter or Summer holiday goer. * Large Kid’s bunkroom/ playroom which has 5 single beds (2 king single size, 3 single size), a flat screen TV with Apple TV, Netflix & Sky TV. * Open kitchen/living/ TV area with large glass sliding doors which completely open up to a huge deck over the Lake on one side and a lovely internal grass courtyard on the other, which is perfect for lazy afternoons out of wind or for kids to run around & play safely. * Inside a gated community so all very safe & intimate & perfect for children who want to run around & explore the amazing NZ native surroundings. * 5 bed Bunkroom, on the same floor as the living area, 5 beds (2 king singles & 3 normal single size beds), large Flat screen TV. * Lanai - Queens size bed, flat screen TV, open fireplace, fridge & large ensuite bathroom with shower. The Lanai is a self-contained cottage, which is perfect for another family or a couple. *Master, with Super King bed, walk in wardrobe, ensuite bathroom with a double shower and a bath, private deck with a very large outdoor stone bath & shower. * No Parties, this property is absolutely not suitable for a large party (must have all noise down by midnight). * Because we live in a very private and privileged community, we would appreciate any guest showing the utmost respect for the small number of other permanent residents at The Point. My name is Sylvie and my husband is Dan. I'm Belgian and Dan is a Kiwi. We have 3 kids aged 2/3 & 6. We love outdoor activities and having quality time with families and friends. We are very social and love to organise dinner parties (especially at our place in Taupo! ), we have been living in Hong Kong for 10 years and love the excitement of this great city. However our favourite moments in our lives are based in Taupo, our sanctuary! We built this house a few years back so we can escape Asia and have an amazing space to be reunited with our kiwi family & friends and also to show our kids what a great lifestyle New Zealand has to offer! This was an amazing place to stay! I would highly recommend it and would definitely rent again when we come back. The property speaks for itself in it's quality, utmost privacy and location. lovely linen, fantastic kitchen (stocked with all the glassware and cooking utensils needed), beautiful outdoor spaces and would have to be one of the best views on the lake. A 5* holiday home which we are looking forward to staying in again soon.